U.S. #2196 from the Great Americans series. 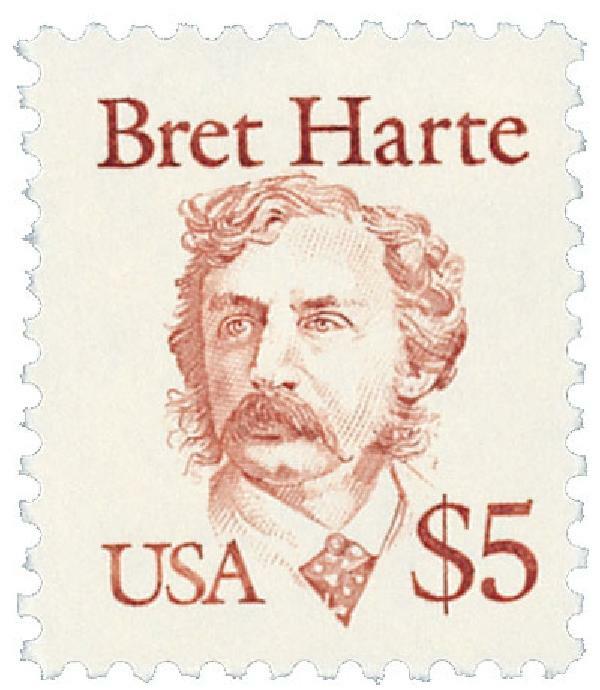 Writer Francis Bret Harte was born on August 25, 1836, in Albany, New York. The author was born Francis Brett Hart after his grandfather, Francis Brett. His father later added the “e” to the family name. His father was also one of the founders of the New York Stock Exchange. Harte loved to read as a child and published his first work at age 11, a satirical poem called “Autumn Musings.” Harte only attended school until he was 13. Then in 1853 he went to California where he worked a number of different jobs including miner, teacher, messenger, and journalist. At one point he served as a messenger for Wells Fargo, guarding treasure boxes on stagecoaches. In 1860 he wrote a controversial editorial in response to the Wiyot massacre that led to threats on his life, forcing him to leave town. 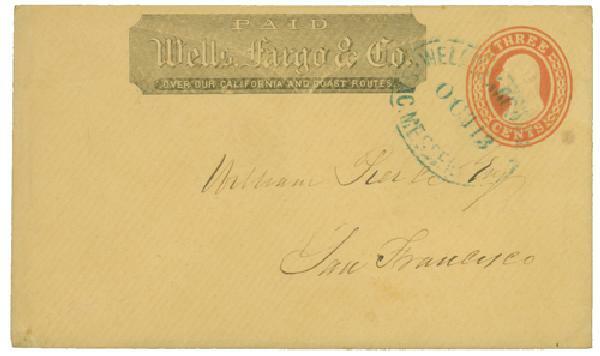 Item #MA1544 – Wells Fargo cover from the gold rush era. Harte then moved to San Francisco. There he began to focus more on writing, having his poems and stories published in several different newspapers and periodicals. Harte also helped to establish a new literary journal, The Californian, and served as editor of The Overland Monthly. Harte’s story “The Luck of Roaring Camp,” which appeared in The Overland Monthly, helped him gain national attention. His poem “The Heathen Chinee” earned him even more attention after it was published in several national newspapers. 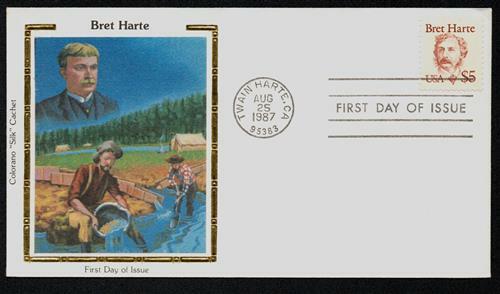 U.S. #2196 FDC – Harte Silk Cachet First Day Cover. Harte then moved to Boston to promote his literary career. He began working for The Atlantic Monthly, but his popularity eventually declined. In 1880 he was made U.S. Consul to Glasgow, Scotland. He then settled in London, spending the last 24 years of his life in Europe. He continued to write extensively into his final years. Harte died on May 5, 1902 in Camberley, England. 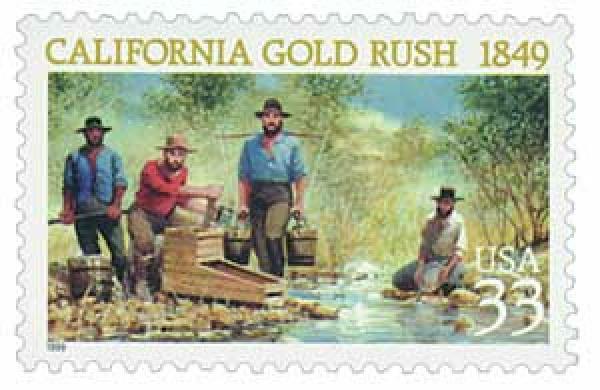 U.S. #3316 – Harte’s most popular stories revolve around his time in California and the gold rush. Issued on Harte’s 151st birthday, the stamp pictured above was the first definitive issued in miniature sheet format. 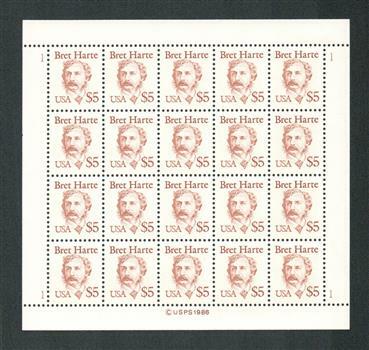 U.S. #2196 – Bret Harte mint sheet. Click here to read some of Harte’s writing. 6 Responses to "This Day in History… August 25, 1836"
My paternal grandmother got me interested in stamp collecting back in 1948.
for me for many years…… I am now 83. Regards…. Can you tell us more about the Wiyot massacre in 1860 and what Harte wrote in his controversial editorial about it? My father was a big admirer of FDR and served in the CCC in 1933. He did not have a stamp collection but knew FDR did. So my father encouraged me to collect stamps too. I am over 70 now and still enjoy the collection I started at 16. Stamp collecting is a wonderful hobby. Wish more younger folks would enjoy it. These historical events surrounding the issuance of our commemorative stamps is mentally invigorating. Thank you Mystic for these tidbits. It has prompted me to do research on peripheral events surrounding the issuance of these stamps. One such lookup involves the Wiyot massacre (of 1860), which I had never heard of. It is terrible what we did to the native Americans in the past, and much of which has been covered up or omitted from our history. This terrible event is on such event. There is much to atone for in our history and this is just one event of many. Man’s inhumane cruelty to man seems to have no bounds. The book from Harte that I was familiar with was The Outcast of Poker Flats. I attended Bret Harte Junior High School as a teen, ages and ages ago (long, long, time ago!). Thanks for all the history and your great daily messages. I appreciate them very much.